Curved structural steelwork is an established feature of UK design and construction as it is known to offer a range of benefits, including aesthetic appeal. Curved iron and steel has been used in structures since the mid nineteenth century, but in terms of popularity it started to increase in the late 1970s. Demand for curved steel members since then has been considerable as it lends itself easily to a large range of building types, such as offices, airport terminals, stations, superstores, industrial buildings and leisure facilities. There are three methods of bending steel; each of these processes produces different results, depending on the member, material and radius required. The majority of curved steel is curved by roller bending which is a cold process. Roller bending involves progressive bending of a section by passing the member through a set of bending rolls. The rolls are shaped to a cross section of a steel member being curved. Force is applied across opposing sets of roles and more curvature is introduced in each pass through the rolls, which is repeated until the curvature is achieved. A section is passed through an electric coil which induces electric currents; this will heat up the entire cross section over a narrow band (approximately 50mm wide) to between 700 and 1050°C. Air or water cool the material immediately adjacent to the heated zone. The leading end of the section is clamped to the pivoted radius arm. As the straight section (pushed by a hydraulic ram) moves through the coil at a constant rate, the leading end follows an arc set to the length of the radius arm. The maximum bending radius possible with induction bending equipment alone is limited to the length of the radius arm. For larger radii or multi radius curves, a set of bending rolls may be used in place of the radius arm. Although the bending still occurs within the hot zone produced by the induction coil, the bending force is actually provided by rolls rather than the radius arm. The principal advantage of curved structural steel is its aesthetic appeal. It allows architects and designers to express a variety of forms and makes exposed steelwork an attractive solution. Many sporting stadia have curved steel as large span structures that avoid the use of columns and enhance the viewing experience. As well as being aesthetically pleasing, curved steel can also enhance structural efficiency for example with arches and variable depth trusses. Many commercial properties in London have curved or cambered steel in them. For example, more than 1,000t of cambered and cellular beams have been used in the St. James’s Market development and a similar quantity was used on the Walbrook building. Will incorporating curved steel impact the cost and construction programme? 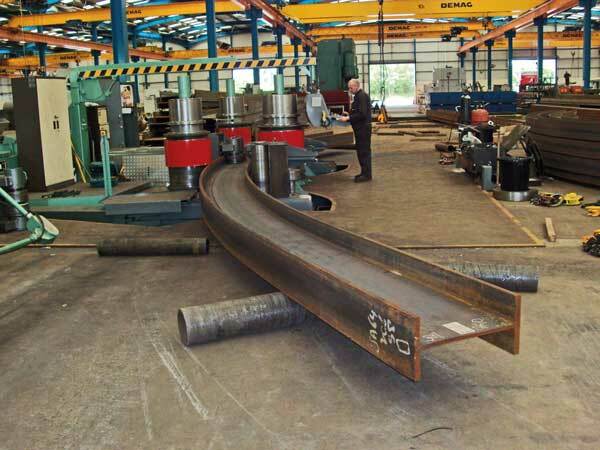 The additional cost of curving steelwork is usually small in relation to the overall cost of the structure. Early involvement of a specialist steel bender and a steelwork contractor by architects and engineers encourages best design practice and ensures that the most appropriate components and details are specified for the job. Generally, if a member can be curved, it will be cheaper than a facetted, multi-jointed member. It also saves on fabrication time by reducing welds in a structure. Using a CE approved bending company ensures that the curved member will be fit for purpose. 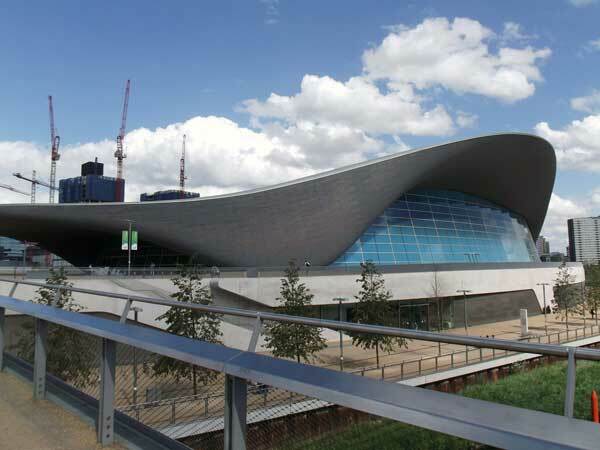 Consisting of 762 curved sections ranging from 203 UBs up to 914 UBs, the London 2012 Olympic Aquatic Centre’s roof (pictured below) is an example of what can be achieved with steel bending. The steel members were curved in the strong axis and the weak axis and they were all differing radii.